Many varieties of ants exist in the Las Vegas, North Las Vegas, Henderson, and Boulder City areas. The most common are argentine ants, fire ants, pavement ants,and harvester ants. Argentine ants are a common household pest and often enter structures during dry or hot weather searching for food and water. Because of the dry and hot weather here in Las Vegas argentine ants are very often found indoors. When they invade a kitchen, it is not uncommon to see two or three queens foraging along with the workers. Eliminating a single queen does not stop the colony’s ability to breed. Pavement ants are dark brown to blackish in color. During early spring, pavement ant colonies attempt to conquer new areas and often attack nearby enemy ant colonies. These result in huge sidewalk battles, sometimes leaving thousands of ants dead. Because of their aggressive nature, they often invade and colonize seemingly impenetrable areas. In hot weather in Las Vegas, NV pavement ants dig out the sand in between the pavements to vent the nests. Fire ants can be distinguished from other ants by their copper brown head and body with a darker abdomen. The worker ants are blackish to reddish, and in an established nest different sizes of ants all are present at the same time. Fire ants bite only to get a grip and then sting and inject venom. They are called fire ants because their painful sting leaves a sensation similar to being burned by fire. Fire ants nest in the soil, often near moist areas, such as river banks, pond shores, watered lawns and weeds. Usually, the nest will not be visible, as it will be built under objects such as timber, logs, rocks, or bricks. If there is no cover for nesting, dome-shaped mounds will be constructed, but these are usually only found in open spaces, such as fields, parks, and lawns. Harvester ants are either reddish orange or black in color and get their name because they collect seeds and store them in their nest underground. They are a large ant when compared to Argentine ants, pavement ants, and fire ants. Harvester ants will not go inside a home and will stay outside. Harvester ants increase the spreading of seeds, protect, and provide nutrients that increase the survival of desert plants in Las Vegas, NV. Harvester ants also provide soil aeration through the creation of galleries and chambers, mix deep and upper layers of soil, and incorporate organic refuse into the soil. Harvester ants foraging in hot, dry conditions lose water, but obtain water from metabolizing fats in the seeds that they eat. Food is distributed by wind and rain uncovers seeds in the top layer of the soil. Most colonies forage on days with high humidity and high food availability, such as those just after a rain when flooding has exposed a layer of seeds in the soil. Few colonies forage on very dry days. Ants almost always nest outside. Exterior perimeter services will help prevent ants from going inside the house. Ant bait will help but sometimes does not work on certain ants. Treating an ant nest is the only way of eliminating the entire ant colony. 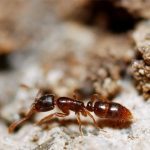 If an ant nest is not found we at Agent Pest Control have products that are effective against ants as well as other pests and are safe to use around children and pets. The residual from our pesticides will provide protection from any ant infestations in your home. PEST CONTROLAnts are very tiny insects that live in colonies. We can get rid of ants in a variety of ways. OUR WORK IS GUARANTEEDWe accept all credit and debit cards!